In order to fly, run, or swim, birds need a lot of oxygen, which they get by breathing air using lungs. They also need a strong circulatory system, including a powerful heart, to circulate the oxygen. A bird’s heart beats much faster than our heart does. A hummingbird’s heart beats about 1000 times each minute; a human’s heart beats about 60-90 times each minute. Birds breathe using a unique system in which air follows a one-way route through the respiratory system. This system is unlike our lungs, in which the air backtracks where it came from. Their system of respiration (breathing) is very efficient – much more efficient than our system. 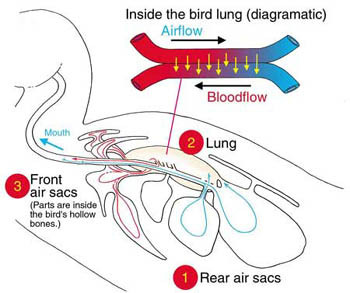 Figure 6.46: The diagram above shows the flow of air and blood in the bird respiratory system. Birds have two relatively small lungs (where gas exchange occurs), but the lungs are augmented by bellows-like air sacs (where no gas exchange occurs). These air sacs keep the lungs perpetually inflated (even when the bird is exhaling). Our lungs alternately fill and empty out. The bird’s respiratory system takes up 20% of a bird’s volume (our respiratory system takes up only 5% of our volume). In the bird’s respiratory system, air first flows through air sacs (located even inside their hollow bones) that direct fresh, oxygenated air into the tube-like lungs (parabronchi, where gas exchange occurs) both when the bird inhales and when it exhales. This system increases birds’ respiratory efficiency and gives them enough oxygen for flight.